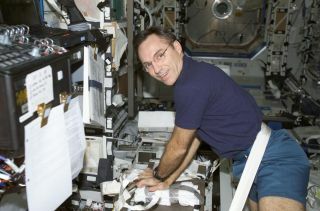 NASA astronaut Carl Walz practices cardio-pulmonary resuscitation (CPR) on the International Space Station using a homemade "human chest" dummy inside the U.S. Destiny laboratory. The rigors of astronaut training determine who has the "right stuff." What some may not know, however, is that every astronaut undergoes life support training. Every crewmember at the International Space Station has the ability to perform cardiopulmonary resuscitation (CPR). The ability to do so in microgravity is a testament to the skills of these individuals and a tribute to the professionalism of the nation's space program. This goal inspires my work at the Disque Foundation and its Save a Life Initiative, which offers free CPR and life support training to communities around the world. Seeing astronauts do CPR training while floating in microgravity can inspire millions to enroll in CPR certification courses in-person or online. It can empower individuals, be they young or old, to emulate the example of our greatest space explorers. Sharing videos of astronauts doing CPR training is also an opportunity for NASA and other space agencies to increase the public's interest in space exploration in general. The topic itself is a reminder of the challenges astronauts face: that emergencies can and do arise aboard the International Space Station, where no one can call 911 for help or wait for a team of first responders to arrive on the scene. The crew must be their own responders, first, second, and last. They alone have the means to do something, should the situation arise, that no one else knows how to do: perform CPR in a weightless environment. That talent defies — literally — what we can feel. We do not know what it feels like to float from one end of a spacecraft to another, never mind some man-made entity orbiting Earth. If the public is more aware of what it takes to become an astronaut, in terms of the qualifications and training a candidate must have, CPR and life support training programs like the Save a Life Initiative could garner stronger public support. The more NASA does to promote life support training, the more attention it generate among adults and children, because this topic appeals to people of all ages. It would renew the country's interest in the space program, in which we can enjoy a mutual understanding with America's astronauts; that we, too, know how to perform CPR. Let us try to popularize this issue, in partnership with schools, students, neighborhoods, and families across the United States and around the world. Let us train ourselves to be like astronauts, willing and able to perform CPR so we can be more prepared for emergencies. We owe it to ourselves to do this much, so we can do so much more for those who need our help. The countdown for this mission starts now.